SEOUL, July 25 (Yonhap) — Familiarity may or may not breed contempt in married life. In many cases, it brings comfort and intimacy, for sure. 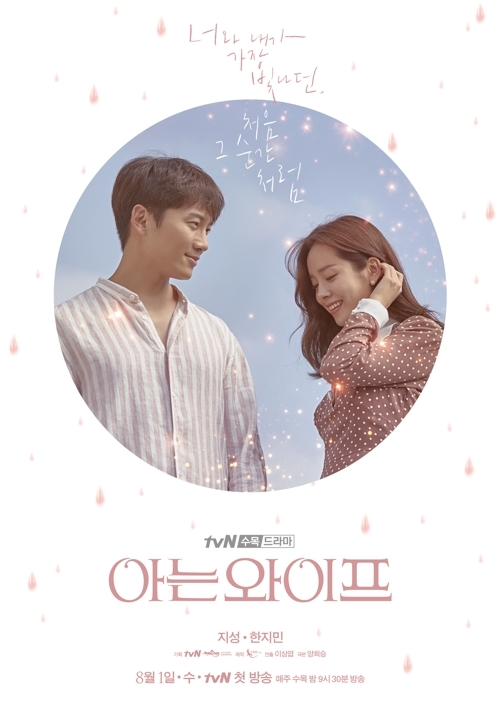 But the new tvN series “Familiar Wife” is based upon the premise that over-familiarity in relationship breeds indifference and uninterest, or even total hatred. And the main couple in the drama reach a point where they get to reflect on the path they didn’t take and wonder what might have been if they did. The fantasy romance doesn’t end there. The story enables the characters to live the life they might have otherwise lived. After all, that is the merit of a fiction, isn’t it? The upcoming series, which will succeed “What’s Wrong with Secretary Kim,” set to air its finale Thursday, depicts realistically the married life of banker Cho Joo-hyuk (played by Ji Sung) and masseuse Seo Woo-jin (Han Ji-min), both worn out by stressful daily lives and slowly turning their backs on each other. “Everyone feels nostalgic about a choice they didn’t make. It is about the ‘what-if’ moment,” writer Yang Hee-seung told reporters at a press conference held at Time Square in Yeongdeungpo in southwest Seoul on Wednesday. “Most couples, married or not, grow tired of each other at some point of their relationship when they blame each other for their withered passion,” she said, adding that the drama is about rekindling love and aimed at reminding one of the preciousness of the person you are with now. Actor Han plays tough married woman Woo-jin, who has to juggle work, child care and taking care of her Alzheimer’s-afflicted mother. Still single in real life, Han said she referred to her older sister and other friends with kids for inspiration on how to play the role. For the role, she “gave up looking pretty” and tried to look as realistic as possible to portray the exhausted, sleep-deprived mother of two. Ji Sung, who plays the pathetic, henpecked husband, decided to appear in the upbeat show, after starring in the dark thriller “Innocent Defendant” on SBS, where he played a man fighting a court case to clear himself of the false charges of killing his wife and daughter. “The message of this show is clear. It will remind you how priceless your current life and people around you are,” he said. When he was first offered the role, the actor declined the offer because he wasn’t “confident” that he could pull off playing an ordinary married man. Having played strong characters in his previous works, he said it was surely a challenge. “The story will cheer and bring comfort to married couples,” he said.